This group showed us how to have fun! Jim and I have had the great good fortune this past weekend of hosting five couples who call themselves “The Spartans.” The original Spartans started out as a group of young boys being invited to attend a summer camp in Wayne, New Jersey in 1951. The Junior Counselor of this first group of attendees then organized the boys into a Friday night Social Club meeting at the Patterson “Y”. The rest, they say, is history. 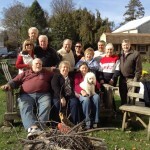 For over sixty years now, many of the original members, counselors, and their spouses a have stayed friends. The Spartans have enjoyed numerous activities over the years, i.e. Cruises to Canada, and Bermuda, Wine Tours, New Year’s Eve Parties, Picnics, Baseball Games, and occasional stays at B&Bs. We were very pleased to have them with us this past weekend.